Mr. Genetti, how did Alfayachtsyard start and what are its objectives? The company is made up of an equal partnership between "Alfayachtsyard", already present on the C“te d'Azur, in Antibes, and "Nuova Simar", a company specialising in Caterpillar assistance. The objective is that of transferring experience already acquired in our French yard to the new premises in Liguria, carving out a primary role in this area of the world as well. Why did you choose to set up an operative plant on the coast west of Genoa? 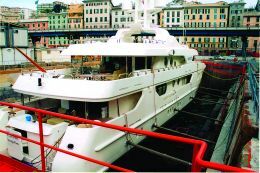 The strategies and objectives linked to the choice of this area were almost obligatory, in the sense that we wanted to identify in the western or eastern Genoa area, a location capable of housing lifting apparatus for mega-yachts up to 50 metres in length with a weight of 150 tonnes. The area acquired will be suitably restructured and renovated with modernisation of the infrastructures necessary for a perfectly operative boatyard. All this plus a 7500 sq/m yard and warehouses for refitting tenders and storing materials at our disposal. You also have the not inconsiderable advantage of being able to use a dry-dock located inside the Port of Genoa, don't you? Yes, this is true. 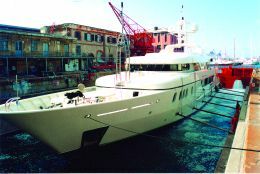 The dock is managed by the "Rimorchiatori Riuniti" company and can contain super-yachts up to 60 metres in length. It can however be considered to all effects a structure at our disposal due to the collaboration developed with this company; our objective is that of increasing our refitting business regarding boats of a certain size. This cooperation contract for renting the dry- dock shows shrewd planning management on our part, to integrate our needs with those of the "Rimorchiatori Riuniti" company. Tell us about the operative project for restructuring the area that you have just acquired. Work relative to reorganisation of the surface area at our disposal is already at a good stage, in the same way that the renovation work on the existing infrastructures is almost completed. I would say that by now we really are very close to operation start up in a complete and satisfying way for our clientele. The last few days have seen the 450 tonne maximum capacity travel lift positioned and a wet dock has been brought back into use where a 130 tonne capacity crane can operate. In addition we have at our disposal a 60-metre warehouse where we have put mezzanine flooring for tender storage. The area of water belonging to us in front of the boatyard, taking on strategic and operative importance, has been suitably prepared with renovation of the quays in reinforced concrete and the insertion of new floating jetties. Each move is the result of a desire to be prepared in the face of an elite clientele that will quite rightly be very demanding. The whole surface area of the airport in Genoa is undergoing radical changes due to a mega project for the construction of the new tourist port in Sestri Ponente. On a financial level, have you in any way been able to benefit from assistance or concessions due to the fact that you are in any case renovating an area that is an integral part of this project? Absolutely not. Our financial efforts have been backed solely by the "Alfayachtsyard" partners. 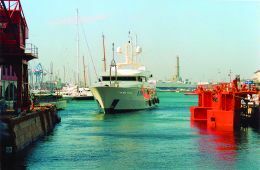 Considering that use of the area is governed by a state concession, precisely due to this restructuring of the whole western airport basin, the whole extension dedicated to boatyards may in the future be moved to another area of the port. In any case, we have links of reciprocal collaboration with the company in charge of building the new tourist port. In loco setting up of your business calls for the involvement of a fairly elite clientele. What are your intentions and ideas for attracting this target to your new boatyard, set up so recently? We must rely on the quality of the services we can offer compared to other competitors and on the level of the work carried out. Some types of treatment will be based on less artisan, more industrial standards while maintaining that all important artisan component for certain types of work as our strong point. Put briefly, the card we aim to play will be oriented around fundamental aspects: impeccable service, product quality, new structures, innovative materials, new generation technology and know-how and a quality-price ratio in line with the current market trends.